This follows on from Part 1, Part 2, Part 3, and instructions for how I made my wreath tails. 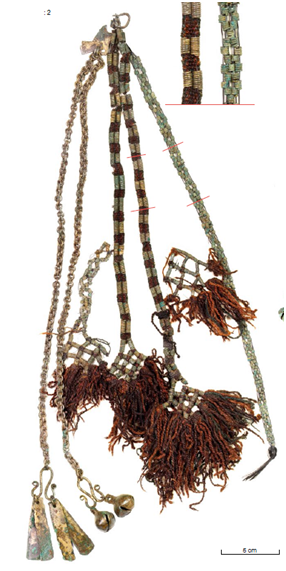 In the Valk et al 2014 Siskala grave catalogue, there are images of at least seven headwreaths that include chains as part of the tails hanging from the back of the headband. 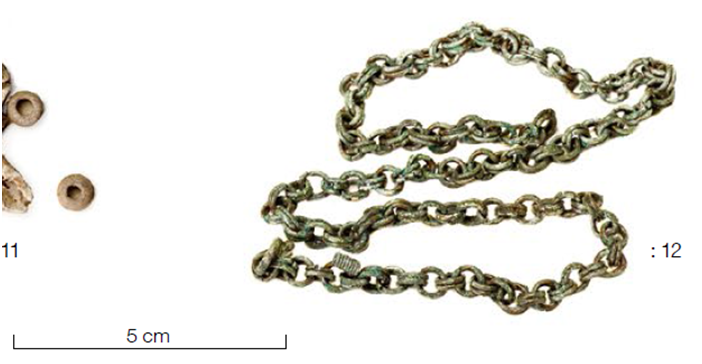 There appears to be two common types of chain; one is a chain made of paired links (Figure 1), and the other is a chain made from twisted wire (Figure 2). Figure 1: An example of the paired chains from p36 of Valk et. al (2014) that are observed in some headwreath tails. Figure 2: An example of the twisted chains from p22 of Valk et. al (2014) that are observed in some headwreath tails. 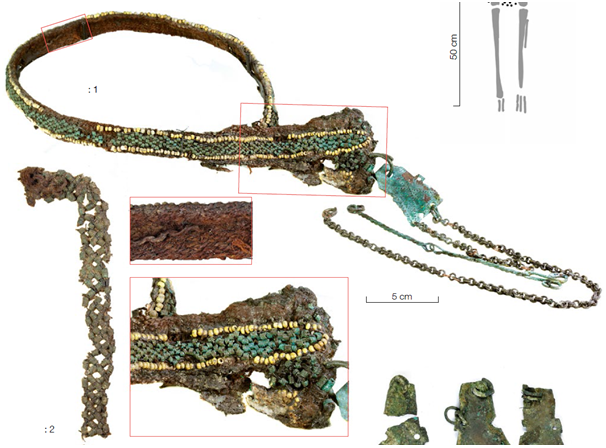 Whilst it isn’t always clear what the chains are made of (sometimes it isn’t mentioned, and often it’s difficult for me to tell with the translation), Valk et al 2014 (p35-36) mentions that the double-linked chain from the extant headwreath is made of bronze. Valk and Laul 2014 (p99) also describes a pronkskett (bronze chain) as part of a headwreath. I measured some of the double-linked chains and roughly estimated the gauge and size of the rings to be broadly consistent with the dimensions of 6mm, 16 gauge bronze jump rings sold by the CopperWireUSA etsy store. It took me about 3 hours, 190 jump rings, and pliers to make enough chain for one tail that would hang a little lower than the coil-woven rhombus tails (as seen in Figure 3). Though the figure below has two chains rather than my one chain, the number of chains used in headwreaths documented in Valk et al 2014 appear to vary from one (p36), to two (p21), to chains that branch and split (p135, p150). Figure 3: headwreath tails published on p273 in Valk et al 2014. 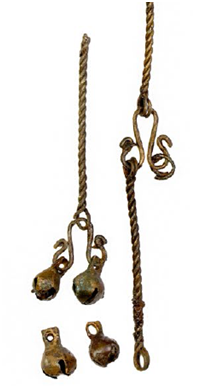 Common items that hang from these chains include trapezoidal metal plates (some of bronze, some of tin), S-link links, large ring links (similar to those small rings used in keyrings), and round bronze bells (p21-22, 40, 69, 216, 268, and 273 of Valk et al 2014). Figure 4: headwreath tails published on p21 in Valk et al 2014.This shows both kinds of chain (paired links and twisted), and how the tails could be attached to the headband. I decided to make s-links and round bells to hang from my chain, in a similar arrangement to p273 of Valk et al 2014. Looking at the measurements in Valk et al 2014, I estimated a wire size of 16 gauge. I haven’t yet identified a composition for the s-links, however, they look to be made of similar wire to the chains themselves, which can be bronze. As such, I extrapolated that the s-links may be bronze as well. The s-link was made by bending the 16 gauge bronze wire around dowel and pliers to get a shape that was similar in size and appearance to extant examples. The various bells depicted in Valk et al 2014 vary quite a bit in size. I was unable to find bronze bells, however, I substituted brass bells since both bronze and brass are alloys of copper with a similar goldish hue. 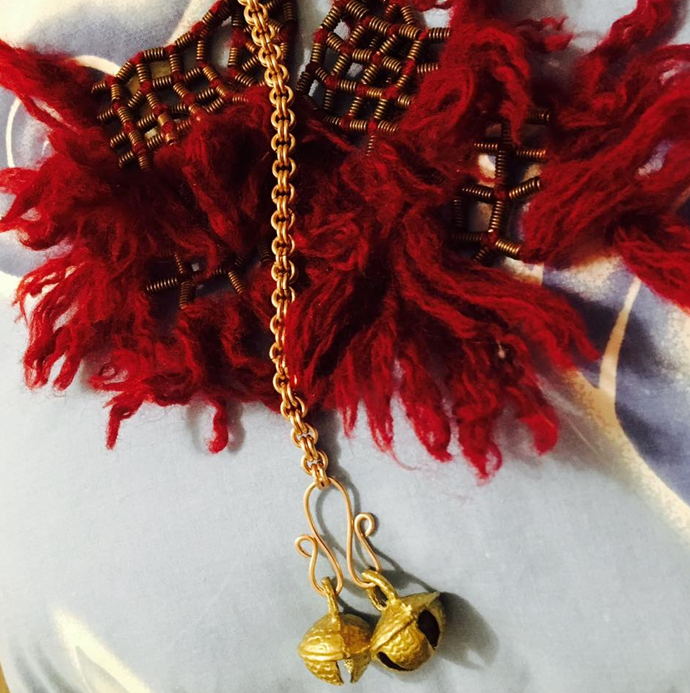 The bells I used are 17mm brass from the uDazzleSupplies etsy store, with the size and shape similar to (but obviously not identical to) images and sizes of some of the bells depicted in Valk et al 2014. Figure 5: The chain, s-link and bells used in my headwreath. Photo and tails by Ceara Shionnach, 2016.